Bhagamandala is a pilgrimage place in Kodagu. It is situated on the river Kaveri in its upstream stretches. Bhagamandala is on the banks of the confluence of three rivers, Cauvery, Kannike and the sub terrain Sujyoti, popularly known as "Triveni Sangama". It is a common practice for pilgrims to take a dip in the triveni sangama and perform rituals to their ancestors before proceeding to Talakaveri, the birthplace of Kaveri. During Tula Sankramana which falls on October 17th or 18th every year, pilgrims assemble here in large numbers. Located about 38 km from the district headquarters Madikeri and is connected from Madikeri, Virajpet and nearby places in Kerala. Government and private buses are available on all of these routes. Sri Bhagandeshwara temple is a Famous temple near triveni sangama, where Bhagandeshwara (Ishwara), Subramanya, Mahavishnu and Ganapati temples are there.. its also called as Bhagandeshwara Kshetra, The Bhagandeswara temple complex though said to have been built by the Cholas prior to th 11th century follows the gabled roof style of the Kerala temple architecture common on the west coast. 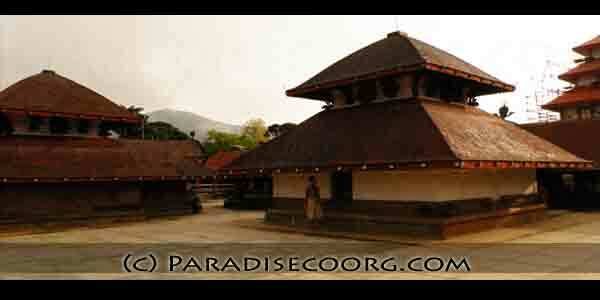 A short distance from Bhagamandala is the temple at Padi, which houses the deity Lord Igguthapp and is considered by many Kodavas to be the most sacred shrine in their homeland. Bhagamandala is a famous Honey marketing centre, the bee rearing centre here is called Madhuvana and possesses a rare museum of objects related to bee keeping and is the only such centre in the entire state. There is an Apiculture Training Institute run by the state government. During 1785-1790, the area was occupied by Tipu Sultan. He renamed Bhagamandala to Afesalabad. In 1790 King Dodda Vira Rajendra took Bhagamandala back into an independent Kodagu kingdom.